We don't get much variety of Flying Monkeys here in Manitoba.. usually the main staples like Smashbomb Atomic IPA and once every 6 months there'll be a bottle of something seasonal/one off released here for $15 per 750mL. Generally it's very expensive for my pocket.. but they tend to make solid beer.. so why not? 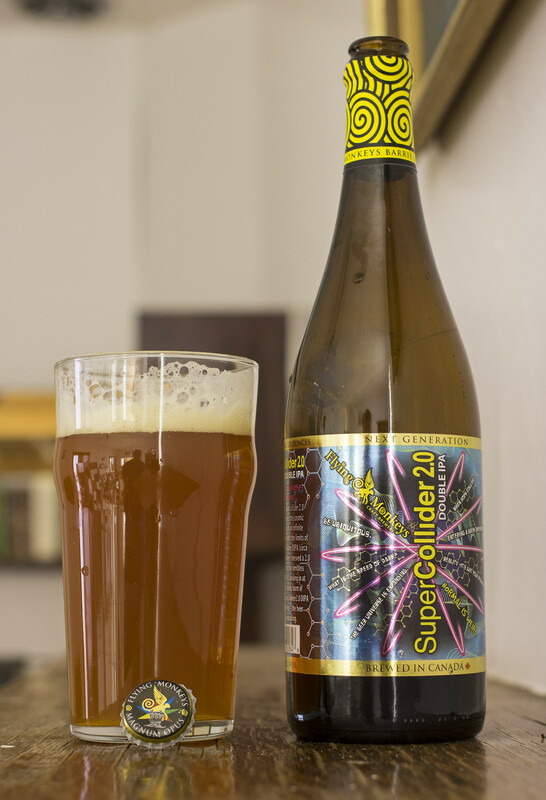 Tonight's brew is their Super Collider 2.0 Double IPA which tops out at 10.4% ABV and 102 IBU, so it's going to be a strong one! Appearance: The Super Collider pours cloudy and somewhat murky iced tea-like copper brownish in appearance, a good amount of beige head makes an appearance at the beginning but slowly disappears as it warms up. Somewhat soapy. Aroma: The aroma is a bitter and sweet medley of flavours. For the bitterness I'm getting the typical bitter pine bite at the beginning, a hint of grassiness and a hint of lemon. The sweetness is a mild tropical aroma of various fruits such as pineapple, tangerine peels and a hint of grapefruit. Fairly welcoming but nothing too special in a DIPA. Taste: Quite a rush of bitter pine right from the get-go. Moderate notes of grapefruit and again - some sweet tropical flavours such as pineapple, tangerine peels and a light biscuity breadness pairing up with caramel. Overall Thoughts: Worth $15/bottle? Perhaps as I certainly enjoyed it.. great bite of piney hops - leaves a bit of a hoppy aftertaste on my tongue. Great deal of tropical sweetness. Certainly a better deal than anything Rogue puts out.